For our Day Of The Dead party, we decked out Karen June's house to look like it belonged to the famous Mexican artist, Frida Kahlo. Karen will be channeling the great painter as our host for this costume fete and we wanted to image how Frida would have decorated for her guests. (All of whom will come dressed as famous painters or portraits...stay tuned for that on Friday!). With Halloween coming up, it was fairly easy to find skeletons in the craft stores. We needed them to look like traditional sugar skulls so we spray painted them a uniform white and then added the colorful florals freehand. You'll notice we have quite a bit of Frida infused into the decor. We added a headpiece of silk flowers to the bigger sugar skulls to mimic Frida's iconic look. Because these skulls were made of styrofoam (again, painted an all-over white and then with added color), the stems of the flowers were fairly easy to poke through. We found this fabulous fabric on Spoonflower. It's a drawing of Frida Kahlo in a a repeating pattern that was perfectly sized for pillows. We chose different colors of pom-pom trim to outline the designs and Karen June used some fabric she had on hand for the backs. When you walked in the living room, the first thing you noticed was the couch, decked out in these colorful pillows, setting the tone for the whole party. Karen June wanted to make a signature art piece for the party and creating a personal shrine seemed appropriate. There's also a photo of Frida Kahlo and her painter-husband Diego Rivera up on the flat screen TV, which was a great way to keep that area from looking like an empty black rectangle during the party. We made a gazillion paper flowers (another traditional look for Day Of The Dead celebrations) and hung them from a black ribbon that we strung around the TV. Other flowers were scattered across the console along with candles and another sugar skull. (Karen already had that amazing frame around her TV...it was a gift from a friend who works in a frame shop. She painted it black and Karen's husband outfitted it with speakers and channels to hide the wires. An awesome DIY on its own!). On the wall next to the TV, we swapped in photos of Frida (which we got from postcards) to Karen's existing frames, added several religious pillar candles (which you can buy cheaply at places like Target), crocheted doilies and a few small religious icons that Karen collects when she goes to Greece. 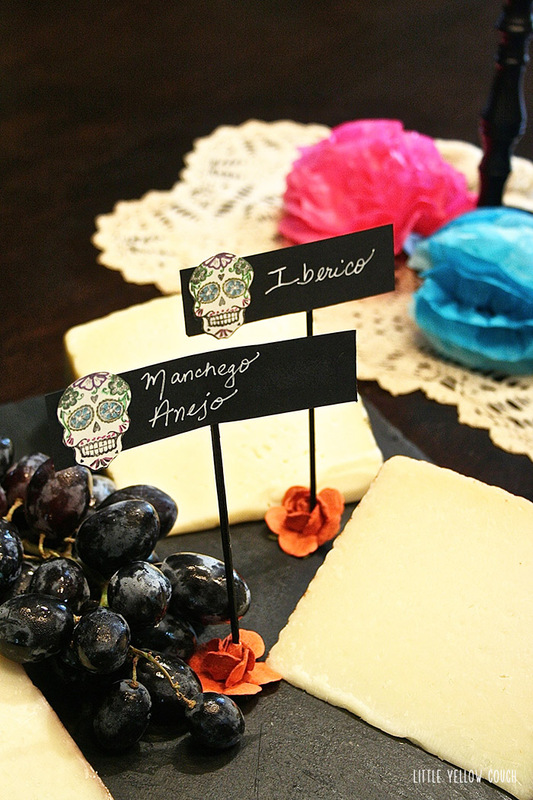 It was a dessert party and, along with Mexican Hot Chocolate shots, Mexican beer and Spanish wine, we served a variety of cheeses and dark chocolates. If you missed it, be sure to check our Day Of The Dead invites using museum postcards. And on Friday, we'll share our photos from the actual party where you'll see all of the costumes put together by our guests. Everyone looked amazing and we can't wait for you to see them!